David Hogg, a Parkland shooting survivor and gun-regulation activist, is calling for a boycott of Arby’s until the chain stops advertising on Laura Ingraham’s Fox News show. Ingraham mocked Hogg on Twitter for not getting into the colleges he applied to. Companies including Wayfair, TripAdvisor, Nutrish, and Nestlé have announced they will pull ads from Ingraham’s show after Hogg launched a boycott campaign. Arby’s is getting dragged into the boycott battle playing out after Fox News host Laura Ingraham mocked a Parkland shooting survivor on Twitter. On Wednesday, David Hogg called for advertisers to pull their commercials from Ingraham’s Fox News show after the host mocked him on Twitter for not getting into colleges he applied to. Since Wednesday, companies including Wayfair, TripAdvisor, Nutrish, and Nestlé have announced they will pull ads. On Thursday evening, Hogg took to Twitter to target another apparent Ingraham advertiser: sandwich chain Arby’s. 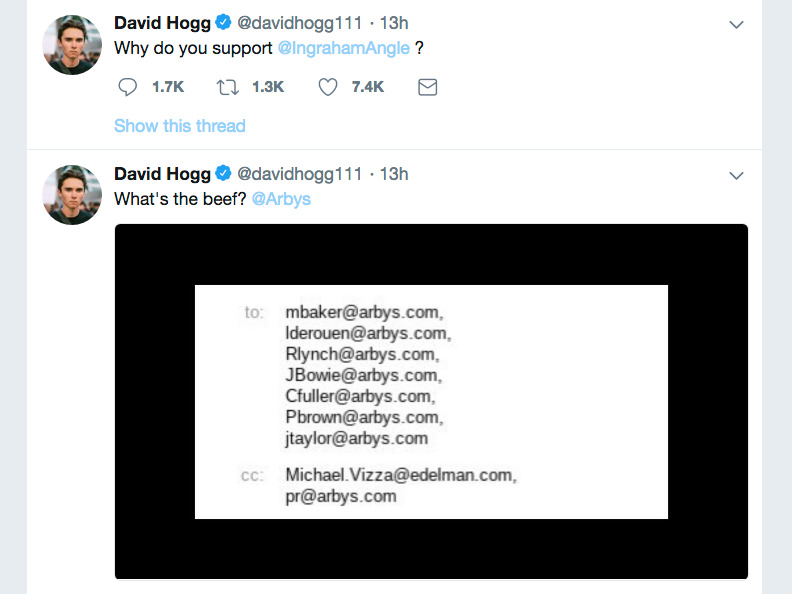 “Why do you support @IngrahamAngle ?” Hogg tweeted, with a screenshot showing an email to various Arby’s executives and press contacts. 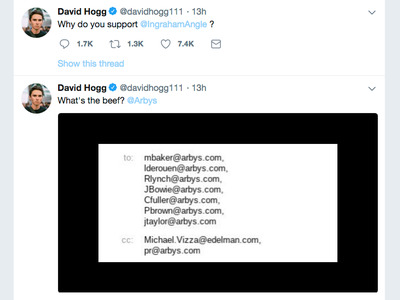 Hogg seems to have deleted the tweet listing executives’ emails, with the caption “What’s the beef?” at some point on Friday morning. Arby’s did not respond to Business Insider’s request for comment. Other people backed up Hogg’s call for boycott on Twitter on Thursday. @Arbys @ArbysCares I am not a fast food fan, in fact I refuse to eat any fast food—except your amazing turkey w/swiss sandwiches! Awesome, and wholesome. But, I noticed you advertise w/Internet bully @IngrahamAngle ???? Would hate for something to happen to my appetite for Arbys.